When Vikram Jandhyala put on a set of goggles one day this fall, he saw a white object sitting on a table in front of him. He reached out with a virtual hand — guided by his real hand — and grasped the object: a virtual kidney stone. The stone had been conjured into virtual reality from a patient’s computed tomography (CT) scan. It was created by three University of Washington graduate students, who had turned an idea from a class assignment into a business, Pear Medical. “This is really amazing,” Jandhyala marveled as he turned the stone over in the air, looking at its contours. Then he peeled off the headset and began peppering the entrepreneurs with questions. As the executive director of the UW’s startup incubator, CoMotion, Jandhyala is charged with nurturing fledgling companies like this one. He’s also an electrical engineering professor with 200 papers to his credit. And he’s the co-CEO of Global Innovation Exchange (GIX), the graduate institute that will open in Bellevue next year in partnership with Tsinghua University, one of the top universities in China. The veteran of two startups himself, Jandhyala, 44, wears so many hats at the UW that he has his business cards printed sideways to list them all. His skills are so unique that UW President Ana Mari Cauce created a new position for him at the university: Vice president of innovation strategies, reporting directly to her. The position hints at the way Jandhyala is helping Cauce shape a new vision for the university’s future, one that embraces innovators and entrepreneurs not only because successful products can bring revenue to the university, but also because their work can solve pressing social problems. “It’s fun to work with him because you can almost see his brain light up — he’s excited about ideas,” Cauce said. There’s nothing flashy about Jandhyala save for the diamond earring he wears in one ear. He is low-key and approachable. He likes to make people laugh. Those who work with him say he excels at breaking down the barriers between academics and entrepreneurs, and between people working in different colleges and departments. Sometimes, though, they say he’s so focused on the big picture and moving so quickly that he misses details, or fails to communicate with everyone who needs to know. He believes the UW’s new emphasis on innovation could physically transform the very city itself, making the University District into an innovation district, where newly created business spinoffs set up their first offices, sustained by one another’s energy and ideas and by their proximity to the university. That vision doesn’t sit well with those living in the adjacent neighborhoods, who are unhappy with the UW’s innovation district talk, and fear the U District will lose affordable housing and its funky street appeal, and become gridlocked with traffic. And they haven’t even heard of Jandhyala, who is better known in the tech and academic worlds than outside of them. “Never met him,” said U District neighborhood activist John Fox, of the Seattle Displacement Coalition. One of Jandhyala’s biggest projects to date has been revamping the university’s startup business office, CoMotion, which changed its name and shifted its mission in January 2015, moving away from focusing primarily on nurturing companies that could boost the region’s economy and make money for the university. Under Cauce and Jandhyala’s direction, the emphasis is on fledging enterprises that could provide a social good, or solve a problem. And entrepreneurship is not just something students do after they graduate, but something they can do throughout their educations — “becoming more embedded into the central mission of the university,” Jandhyala said. One of CoMotion’s newest spaces is a big, open room in Fluke Hall — the CoMotion Makerspace — filled with laser cutters, 3D printers, sewing machines and a wide variety of other tools. It’s free and open to all students, faculty and staff, a place where they can play with technology and create anything they can dream up. 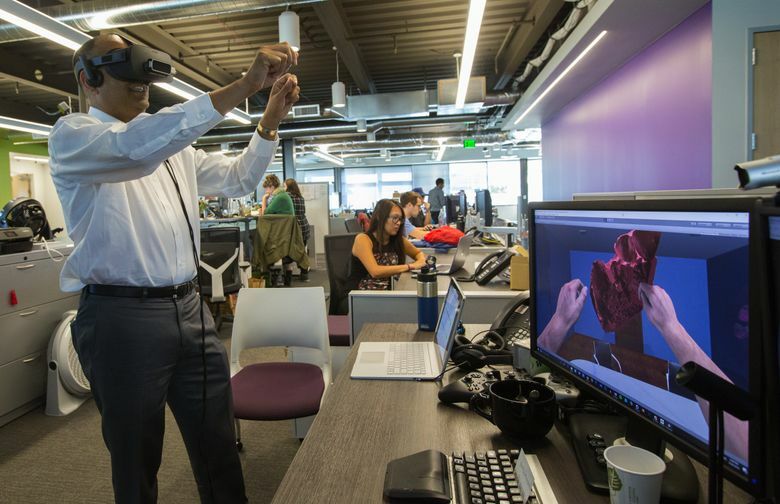 In CoMotion’s other new space, on Roosevelt Way Northeast, the university is helping a number of businesses focused on augmented and virtual reality. Pear Medical, the virtual reality medical company, believes its work may one day allow a surgeon to practice a complicated operation in advance, improving the chances for success. Another UW startup, M3 Biotechnology, is developing therapeutics to treat Parkinson’s and Alzheimer’s. And the CoMotion lab helped launch Vicis, a company designing a new football helmet to reduce the risk of concussions. As head of CoMotion, Jandhyala pioneered “some really enlightened policies” related to tech transfer and external collaborations, said computer science professor Ed Lazowska. ”He’s all about partnership,” Lazowska said. Ryan James, a UW Ph.D. student and one of the founders of Pear Medical, says he was skeptical at first about moving the startup to CoMotion. But he and his partners Mark Laughery and Ahmad Aljadaan have received valuable advice about how to patent their technology, the proper way to incorporate and how to handle intellectual property. “When it comes to understanding our business, they have been a huge asset,” he said. As Co-CEO of the UW’s Global Innovation Exchange (GIX), Jandhyala is also playing a key role in shaping the Microsoft-funded graduate institute that will open in Bellevue next year in partnership with Tsinghua University in China. The exchange is founded on the idea that Chinese and American students will work together in partnerships to try to solve the great problems of this era: sustainability, health, inequality, environmental issues, transportation and clean energy, to name just a few. Jandhyala thinks GIX will appeal to students who want to open startups — and give them the opportunity to earn a graduate degree at the same time. Jandhyala grew up in India, where his parents were both professors — his father in physics, his mother in biophysics. As an undergraduate he attended the Indian Institute of Technology in Delhi, one of the top universities in India. He received his master’s and Ph.D. in electrical engineering at the University of Illinois at Urbana-Champaign, and came to the UW in 2000 as a faculty member, rising to become chair of the electrical engineering department. He is a vegetarian who opposes factory farming, a practitioner of yoga and meditation, a competitive squash player and an amateur drone pilot. His wife is an engineer and Harvard Business School graduate, and they have two boys. Jandhyala founded a simulation software company called Physware (the name later changed to Nimbic) in 2006, which was acquired by Mentor Graphics in 2014. The experience taught him how to work with customers, and gave him an understanding of how faculty and students could come together to create companies. 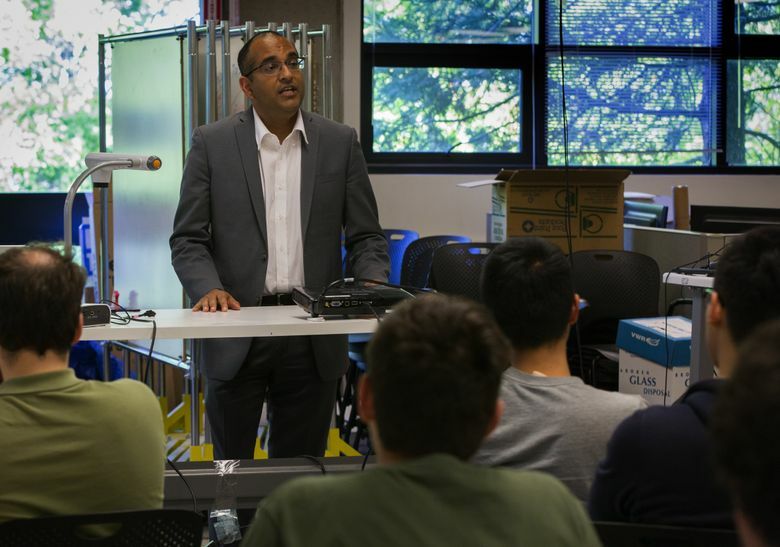 Babak Parviz, vice-president at Amazon and a former electrical engineering professor at the UW, said Jandhyala’s startup experience makes him especially well-suited for the role he plays now. “It just makes it a little bit easier for him to make bridges between the two communities” — academic and tech, he said. Jandhyala has also championed the Amazon Catalyst grants, which award money to anyone on campus who wants to research big, world-changing ideas. The grants are administered by the CoMotion office. Jandhyala believes one of the big issues with tech companies is that their innovations often disrupt an industry — or, as is the case in San Francisco and Seattle, the real estate market. Then, after they’ve made their money, they do a little bit of philanthropy on the side to make up for the disruptions. He wants to flip that on its head — getting young companies to first consider how they may disrupt the status quo, and then how they’ll keep those disruptions to a minimum. Applying that thinking to the UW, Jandhyala is concerned about how the “innovation district” could change the U District. Jandhyala has traveled extensively — he’s been to China 10 times just for work on the GIX partnership — and he points to Shenzhen, a major Chinese manufacturing center and rapidly-expanding city, as an example of how a fast-growing urban district can also be designed as a people-friendly space. Jandhyala recognizes that the UW is the 800-pound gorilla of the U District.